The response to the long awaited completion of the road bridge connecting the Crimean peninsula to mainland Russia has been predictable, prompting a storm of angry comments from Kiev and Washington, and jubilation and relief among Crimea's residents and Russia as a whole. Sputnik dug through the comments to find the most colorful reactions. Both in Russia and abroad, the undisputed highlight of Tuesday's opening ceremony was President Vladimir Putin's decision to jump into a KAMAZ dump truck and drive across the 19 km bridge with a column of trucks and construction machinery along with the bridge's builders. Impressed by the images they saw, and the news that the bridge was completed on budget and six months ahead of schedule, most social media users seemed impressed, whatever their position on Russia or its president. — Guy Elster (@guyelster) 15 мая 2018 г. — Paul Theron (@paul_vestact) 16 мая 2018 г. — Stephen Forster (@Stephen110166) 15 мая 2018 г. Not everyone was impressed. Julia Ioffe, The Atlantic author who was caught manipulating Julian Assange quotes to make him seem pro-Russian last year, complained that Putin broke the law while crossing the bridge, since he wasn't buckled up. Business Insider even made the seatbelt incident part of the headline to its story. The next day, presidential press secretary Dmitri Peskov was asked about it by journalists, saying he "didn't see" whether Putin had buckled up or not. — Julia Ioffe (@juliaioffe) 15 мая 2018 г.
Screengrab of the Business Insider article. But the traffic safety rules jab was probably the most inoffensive criticism from the bridge's detractors. Ukrainian President Petro Poroshenko called the bridge's construction "illegal," and declared that the Russian "occupiers" would "necessarily need the bridge when they will urgently leave our Crimea." — The Bankova (@TheBankova) 15 мая 2018 г.
Crimean Prime Minister Sergei Aksyonov dismantled Poroshenko's threats on Instagram, writing that in the four years since Crimea returned to Russia, the peninsula saw the construction and opening of "a unique bridge, a modern airport, an energy bridge, a gas pipeline, new schools and kindergartens…power stations, an autobahn, the modernization of industry, energy, agriculture and social infrastructure." At the same time, Akysonov added, "in those same four years, the Ukrainian regime unleashed a civil war," lost the Donbass, "blocked water and electricity to Crimeans, organized a transport and food blockade of the peninsula, sent saboteurs and threatened us with war. So we have something to measure ourselves against." The US reaction was also predictable, if muted, with State Department spokeswoman Heather Nauert tweeting that the United States "condemns" the bridge's construction and opening, and particularly the fact that this was "done without the permission of the government of Ukraine." "Crimea is Ukraine," Nauert insisted. Moscow's response was measured. "As one could predict, Washington was not happy with [the bridge's dedication]. But Crimea is Russia. We shall not ask for anybody's permission to build transport infrastructure for the sake of the population of Russian regions," the Russian Embassy in Washington wrote on its Facebook page. — Heather Nauert (@statedeptspox) 15 мая 2018 г. Perhaps the most odious response so far has come from the Washington Examiner, which featured an op-ed by contributor Tom Rogan, who penned a provocative piece titled "Ukraine should blow up Putin's Crimea bridge." The journalist called on Kiev to launch airstrikes against the bridge, even if doing so resulted in civilian deaths, to send a "message" to Putin. The Washington Examiner's provocative op-ed. Twitter users had their own "message" for Rogan, calling him a "warhawk" and asking if it "hurts to live without a brain." Insane Washington warhawk wants the Ukies to blow up the Crimea bridge as a provocation. — Mike The Skeptic (@Michael48977368) 16 мая 2018 г. Journalists promoting terrorism which could impact innocent lives? Every day you guys find a way to reach new lows. — Bateman 🇵🇱🇮🇹 (@P_Bateman139) 15 мая 2018 г. The science of hatred, eh? Does it hurt for you to live without brain, Tom Rogan? — Ruslan Akhmetov (@DrizzleRus) 16 мая 2018 г. — Katie Davies (@katiedavies91) 16 мая 2018 г. 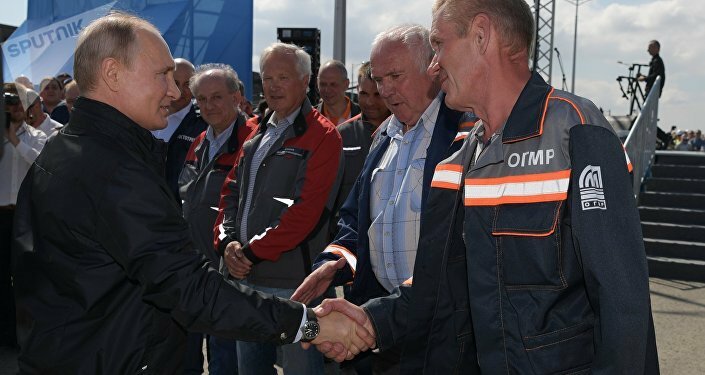 In Crimea and the rest of Russia, the bridge's opening was met with jubilation, celebration, and of course selfies of people posing, and driving, along the newly opened road to the peninsula. — Элен Ермакова (@ermakovaTT) 16 мая 2018 г. "We will never again see the Crimean Bridge so empty. The final minutes before the opening. Hooray! Let's go!" — Kate Golden (@KateGoldenSmith) 15 мая 2018 г. "27 months of work; 12 million tons of building material; 10,000 bridge builders; completed half a year ahead of schedule: the Crimean Bridge one hour before opening." — sarah kiyimba (@sarahkiyimba) 15 мая 2018 г. — Veltmaete (@Veltmaete) 15 мая 2018 г. — Крымский мост (@Krymsky_bridge) 16 мая 2018 г. "Accepting the first cars. The most anticipated moment of the last three years!"